For your hungry eyes, I may have a gem for you. For the past 9 years, I have been employed by a charity based, community event producing, organization known as Events Edmonton. The current flagship event that Events Edmonton produces is Taste of Edmonton. Prior to Events Edmonton, this organization was known as the Klondike Days Association and was registered as a charitable organization in 1965. The Klondike Days Association came to be when, in 1962, the City of Edmonton changed the name of it's annual agriculturally based exhibition from the Edmonton Exhibition to a refreshed brand title known as the Klondike Days Exposition. The Klondike themed Exposition was embraced by the citizens of Northern Alberta to the point where almost every Edmontonian dressed in Klondike attire to celebrate the late July event. In addition to the Exposition being staged at the Edmonton Exhibition (now Northlands) fairgrounds, Klondike Days started to feature many other, outside of the fairgrounds, activities throughout the city. Some of these community based activities included the Sunday Promenade, Kobasa Eating Contest, Klondike Kate Pageants, King of the Klondike Competition, Bathtub Derby Races, Sourdough Raft Races, etc. To manage the non-fair related Klondike programs, the Klondike Days Association was formed. Upon commencing work with the Edmonton Klondike Days Association (now Events Edmonton), I noted a peculiar framed photo that hung prominently on the wall within the office. To paint the scenario of this photo, it can be best described as a promotional picture from a Klondike Kate photo shoot in one of the log cabins at Fort Edmonton Park. 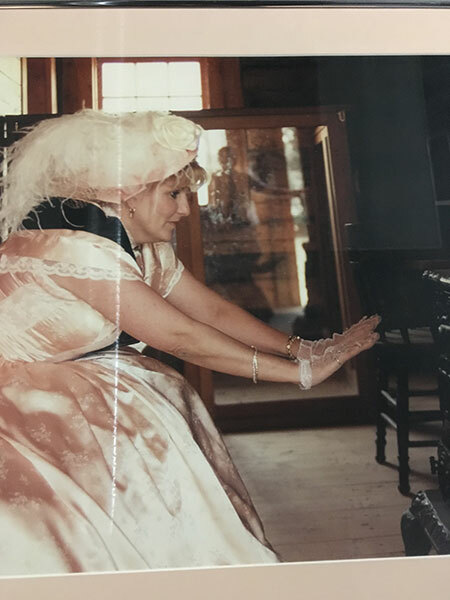 This 1980's era photo depicts a period dressed Klondike Kate reaching for a pot belly stove in a hand warming pose. To accomplish this shot, the photographer positioned him/herself at the rear end of the log cabin. With the camera lens pointing squarely at Klondike Kate's right side, the front door to the cabin was fully exposed in the background as well. While conducting the photo shoot, the camera crew and Klondike Kate didn't notice anything that was unusual in nature. However, upon developing this one particular photo, a ghostly apparition can clearly be seen at the front entrance area of the log cabin. The veteran staff member in our office at the time was the General Manager who had spent approximately 10 years with the organization. Armed with several questions, I approached the GM with the hopes of curbing my curiosity. Regrettably, the GM had limited information concerning the photo. In addition to what has already been stated about the photo, I only learned that quite a number of paranormal researches have examined this photo and determined that it is one of the better legitimate ghost images ever seen. I welcome you to pore over the photo and provide me with your feedback. The following comments are submitted by users of this site and are not official positions by yourghoststories.com. Please read our guidelines and the previous posts before posting. The author, Quirky, has the following expectation about your feedback: I will participate in the discussion and I need help with what I have experienced. Thank you for wading in with your in-depth view, MarvinScott. I appreciated your unique perspective which supported the possible legitimacy of the ghostly looking form. As much as I appreciate everyone's insightful observations concerning the photo's strange image, what I would treasure is to hear from the model (Klondike Kate) and/or photographer (I'm fairly certain that the alleged apparition would refuse to talk to me -- lol). Accordingly, I have made some inroads concerning my investigation. My research revealed the identity of this Klondike Kate. Upon securing contact information, I will reach out to her. Hopefully; before too long, I will have some juicy information to share with the YGS community. I also downloaded the photo and zoomed in a few times. My question is if this is a mirror and it is reflecting a spirit, how then is the model's image only a shadow in the mirror rather than a reflection? Strange. And if the image is a real person, again, why does the mirror reflect him and not the model's hands? Maybe I am looking at the equation incorrectly. Thank you for sharing your observations with us, lady-glow. A cursory view of the image, made me think that it was a male. Now that you and others have mentioned that the image reflects a female, my in-depth review has made me realize that this is quite conceivable. I hope to have further information concerning this photo for everyone shortly. Thank you for the thought provoking comments concerning my post, Jan. In thanks to the astute comments that I received from you and other YGS readers, my view of the posted photo has swung. To explain; when first posting the photo, I thought that there was good reason to believe that the photo did include an apparition. However, fellow readers have now made me realize that the ghostly image can represent any one of a number of things. Therefore, I'm grateful for this eye-opening experience. Please know too, Jan, that I really enjoyed the comical spin that you cleverly weaved into your observations. I'm still laughing. Looking forward to sharing further information with Team YGS as soon as it becomes available to me. Best wishes for a pleasant weekend. Yes, you are right, is that a faint shear over it? It shows clearly at 250%, just to the right of the dog horse face. Thanks for sharing, looking forward for any additional information you can provide. Interesting, I like it when a photo is part of the equation. Here is my take on this picture. A large mirror is used by the photographer, to enhance his picture of Kate. Clearly (to me) in the right side of this mirror, there is a darkened outline of the old wood stove. In the lower portion of the mirror is a distorted reflection of Kate's dress and arms. What you are concentrating on is the clear reflection of someone just entering and still has a hand on the just entered door. At first glance I thought it was a man wearing a tie. Then if looking closer, that arm looks a bit girly. Also, is that a decorated dress she is wearing? Note the arm where the sleeves show partway down her arm, not as a man would wear. Perhaps she was late for the photo taking, and in a hurry to join. Or perhaps she is a curious lady from long ago. If you really want to spook yourself, blow up the picture and see the animal like face with his nose plastered on the mirror. Hello RCRuskin, Cuddlebear & Twilight1011 -- thank you for the comments concerning my "The Ghost of Fort Edmonton Park" submission to the YGS website. In terms of your assumptions concerning the legitimacy of this photo, I think that you all raise some very cogent points. The concern I'm experiencing right now is my lack of knowledge relating to the history of this photo. What I have learned since posting this story is that the photo was taken in either 2002, 2003 or 2004 (not in the eighties). Currently, I'm in the process of trying to determine who the photographer was. Additionally, I'm attempting to contact the Klondike Kate in this photo to see if she can share further details relating to the structure and her memory concerning the image in the background. Once I have secured this information, it will be my pleasure to share it with the YGS community. Finally got to see the picture with better resolution on better 'puter. Also was able to blow up the image. I do believe you are correct that the image of the man must be the photographer. I had not been able to see the reflection of the model earlier, but can I can clearly make out her hands and the front of the stove. The mirror seems cloudy, whether this is a result of dust accumulation, poor print quality, or some other reason I can't say. I find it slightly disturbing that I can't make out the camera. Given that the photo is from the '80's it is less likely a digital image than a chemical one (film). I would imagine that the photo was taken at just about the level of the ladies head or the middle of the photographer's chest. He is likely holding the door open to allow more light on the subject. I'm wondering if he's looking down into a "brownie" type camera. Given the positions of the hands in the reflection I believe the legs issue is more likely that the legs are totally obscured by the lady's gown. I can see nothing about the figure to lead me to believe it is other than a man who has just entered the door to his left. The figure is clearly substantial. You can see his (left) arm in the door opening very clearly. The legs do appear odd as RC points out but I can write that off as poor lighting, which it clearly is. Also, having taken a vast number of photos I can easily believe that some one could enter frame, not around the subject, and be ignored by me until the film was developed. So I'm inclined to ask - is there more to this story, photo, or incident? Interesting photo. The figure appears to be exactly where the photographer would be standing, assuming the wood-framed thing behind Klondike Kate is a mirror. However, I don't see anything resembling a camera or a tripod. So, either a well touched up reflection, or something is there. A little further down, the legs of the figure do not seem to match his torso. I'd be interested in seeing other photos of the building, hopefully from similar angles, but at least of the same portion of the building. Something about that window in the top part of the photo leaves me feeling things do not entirely line up. © The ghost story The Ghost Of Fort Edmonton Park is copyrighted to Quirky. Edited by yourghoststories.com.